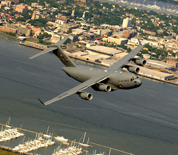 In accordance with the Base Realignment and Closure Commission in 2005, the Charleston Air Force Base and the Naval Weapons Station Charleston combined to created the Joint Base Charleston in 2010. The base's host unit is the 628th Air Base Wing and is responsible for installation support to 53 DoD and Federal agencies with a total force of over 79,000 service members across all branches of the US Armed Forces. Due to the low cost of living in the area and location only 10 miles from downtown Charleston, South Carolina, Charleston AFB has become an attractive home for military retirees. This Charleston AFB directory features the critical info you’ll need to navigate through the many facilities and recreational opportunities available on base.